Head west across the “Old Mississipi” and the famous Gateway Arch and you are on your way to the fabulous American West! Majestic national parks such as Yellowstone, Tetons, Arches, Zion, Monument Valley, Glacier, Grand Canyon National Park…and many more! 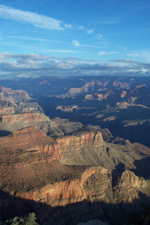 Natural and man-made wonders that rivals any other such vistas in the world! Visit Meteor Crater, Lake Mead and Hoover Dam, exciting cities like Las Vegas and the exquisite vistas of our western coastline! From Sea to Shining Sea, America is a vacation wonderland that all can enjoy! So, Can we show you the way to San Jose... by way of The Painted Desert?